Few, if any, can match Mary Hilda Cavanagh’s experience or expertise as a County Councillor. First elected in 1974, she has established an unparalleled reputation for fighting for the interests of her constituents over the last 45 years. Mary Hilda has served three terms as Chairperson of Kilkenny County Council (1983-1984; 2004-2005 and 2015-2016) and twice as Vice-Chairperson. 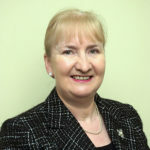 Mary Hilda is currently Vice-Chairperson of the Board of Governors of Waterford Institute of Technology and has just completed a term on the Governing Authority of UCD. Mary Hilda farms with her husband Eddie and son Brian in Galmoy and is a former Vice chairperson of the Kilkenny County Committee of Agriculture. She is a member of the IFA. She has a strong interest in education and has served on Co. Kilkenny VEC (now Kilkenny-Carlow Education and Training Board) for 45 years, chairing the Board for over 25 years. She is Chairperson of the Boards of Management of Coláiste Mhuire , Johnstown and Ormonde College, Kilkenny and a Board member of Castlecomer Community School. She served on the Board of Management at Galmoy NS for many years. Mary Hilda taught for 14 years at the Presentation Secondary School in Ballingarry. She is a qualified Adult Literacy Tutor and has served on the Executive of the National Adult Literacy Agency and Aontas. She has three adult children – Sarah, Anne Marie and Brian and two grandchildren – Olivia and Edward. When she’s not working, Mary Hilda enjoys GAA, crochet, gardening and walking.